Marijuana dependence and withdrawal has been a topic of controversy for years. However, research studies, as well as reports of users in treatment, strongly suggest the presence of withdrawal symptoms in chronic and heavy marijuana users. First 24-48 hours: Increased salivation, restlessness, tremors or feeling jittery, increased body temperature. 2-3 days to a week: Insomnia, loss of appetite, irritability, anger, and/or aggression. If you believe that you or a loved one may have developed a dependence on marijuana, there are various levels of treatment available. One type of treatment isn’t superior to another; it all depends on your needs and life situation. Seeking professional help can make the detoxification period more comfortable and reduce the likelihood of relapse. Below is an explanation of each level of care and what you can expect to get from each. Detox center: A residential detox program is a short-term program that provides 24-hour supervision throughout the withdrawal period. The trained staff directly monitor symptoms and provide medications to mitigate uncomfortable symptoms, such as insomnia and anxiety. Once the detox program is completed, people either return home or enroll in an outpatient or inpatient treatment program. Inpatient rehab facility: Inpatient treatment centers also provide 24-hour supervision for the duration of your stay at the facility. The length of the program varies from 28 days to several months. Services usually include detox and individual, family, and group therapy. Additional services, such as nutritional counseling, yoga, art therapy, meditation, and recreational therapy, may also be included. Partial hospitalization programs (PHP): Partial hospitalization programs are intensive outpatient programs that consist of group therapy sessions that are held at hospitals or other facilities that avail access to medical services. The groups are run by therapists who specialize in substance abuse treatment and mental health. These programs also provide medication management, if necessary, and give you the opportunity to live at home while receiving a high level of care. They may provide detox. Intensive outpatient programs (IOP): Intensive outpatient programs are similar to partial hospitalization programs. This form of outpatient treatment will, in general, be conducted over the course of half the day or less, and in most cases will not provide medication management. You will usually need to have a physician manage any medications you may be taking. Other outpatient programs include individual therapy, group counseling, and support groups. Individual therapy: You meet one-on-one with a therapist who helps uncover issues influencing your marijuana addiction, as well as identify negative thoughts, beliefs, and behaviors. A therapist can also address co-occurring mental health problems, such as anxiety, depression, bipolar disorder, and schizophrenia. Group counseling: A mental health specialist leads a therapy session focused on sober skills and coping strategies. Groups are comprised of other people struggling with addiction. Support groups: Support groups, such as Marijuana Anonymous, use a 12-step approach to recovery, while SMART Recovery is an alternative group that uses evidence-based practices. Support groups provide you with an encouraging and judgment-free environment to share and learn from others. Facilities may also prescribe medications to manage symptoms such as anxiety and insomnia. Cognitive behavioral therapy (CBT): This form of therapy addresses thoughts and behaviors that lead to substance abuse. A therapist helps the user learn how to replace dysfunctional thoughts with healthier ways of thinking, feeling, and behaving that will contribute to abstinence. 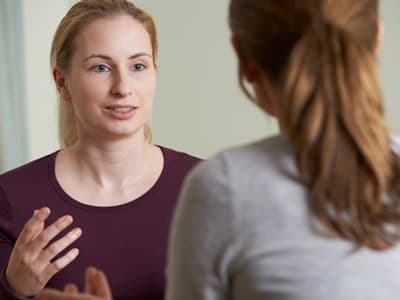 Motivational interviewing: Motivational interviewing is a brief therapy, usually consisting of 5 sessions, that seeks to enhance motivation for change by tapping into a user’s internal resources. Contingency management: This form of therapy consists of monitoring an identified behavior and providing rewards to either eliminate or increase the identified behavior (usually abstinence). Sharma, P., Murthy, P., & Bharath, M. M. S. (2012). Chemistry, Metabolism, and Toxicology of Cannabis: Clinical Implications. Iranian Journal of Psychiatry 7(4), 149–156. Smith, N. T. (2002). A review of the published literature into cannabis withdrawal symptoms in human users. Addiction, 97(6), 621–632. Kouri, E. M., & Pope Jr, H. G. (2000). Abstinence symptoms during withdrawal from chronic marijuana use. Experimental and clinical psychopharmacology, 8(4), 483. National Institute on Drug Abuse. (2016). Marijuana: Available Treatments for Marijuana Abuse. National Institute on Drug Abuse. (2016). Is marijuana addictive? Center for Substance Abuse Treatment. (2010). Protracted withdrawal. Substance Abuse Treatment Advisory, 9(1).